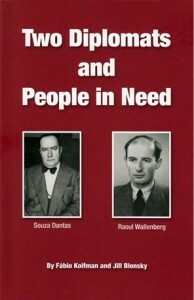 The Raoul Wallenberg Foundation proudly announces the presentation of the book “Two Diplomats and People in Need”. Its authorship belongs to the renowned Brazilian scholar, Fabio Koifman, and to Jill Blonsky, member of the Wallenberg Foundation. 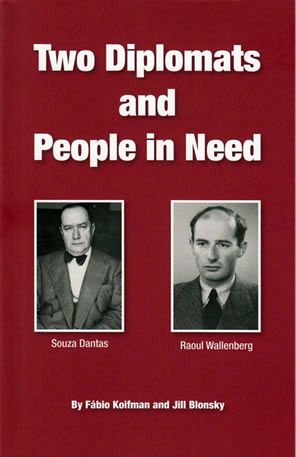 The two articles that comprised the volume depict the way diplomats Luiz Martins de Souza Dantas and Raoul Wallenberg, Brazilian and Swedish, respectively, helped save thousands of persecuted people in Europe, during Second World War. The project started in 2013 when Ambassador Leda Lucia Camargo, then in charge of the Brazilian legation in Stockholm, decided to honor both diplomats. The Wallenberg Foundation expresses its gratitude to Ambassador Camargo, to Alexsandra De Lucena Tingdal, head of the Cultural Department of the Brazilian Embassy in Sweden, to the authors and to the Brazilian Ministry of Foreign Affairs. In the late 1930s, society as a whole – and public opinion – had not yet fully embraced the idea of and attention to human rights and was not consistently engaged in humanitarian assistance. With the exception of the endorsement by a relative few, as the International Red Cross (1863), Save the Children (1919), those concepts became widely accepted only decades later. The League of Nations, an outcome of the Versailles Treaty of 1919, already had failed in its mission to protect citizens and maintain peace and was replaced with the establishment of the United Nations only in 1945, which in turn took a long time to become effective in the field of International Humanitarian Law. But in those troubled times when States failed to guarantee the integrity of their civilian citizens, men and women of principle acted on their own to defend the dignity and survival of many people, and among those heroic individuals were two great diplomats, a Brazilian and a Swede, who are exemplars of two very important traits for the career: diplomacy requires both passion and perspective. It was not easy to obtain an entry visa to Brazil in light of Circular 1.127 of 1937: the possession of property, capital, and family members in Brazilian territory was not always sufficient for a foreigner, unless backed by political interference. The great merit of Souza Dantas was that he tried to help everyone and, facing danger, even issued illegal visas. In mid-1942 and with keen awareness, he described in great detail “the industry of death in all its intricacies”. A diplomat from the age of 24, noted for his professional competence, Souza Dantas believed that he could represent the very best of the Brazilian soul by saving people at risk, foreshadowing a central concern of nations in the decades to come. Other officials of Brazil’s Foreign Ministry, such as Guimaraes Rosa, Aracy de Carvalho, Martins de Souza, and Castro Brandao, also issued visas which saved people whose lives were at grave risk in Europe. Diplomats of other nations acted similarly, such as Japan’s Chiune Sugihara and The Netherlands Ian Zwartendijk in Lithuania; China’s Feng-Shan Hoo in Vienna; Portugal’s Aristides de Souza Mendes in Bordeaux; Hiram Bingham IV of the United States in Marseilles; and many others in Budapest, such as Carl Lutz of Switzerland, Carlos de Liz-Teixeira Branquinho from Portugal, Italy’s Giorgio Perlasca, Spain’s Angel Sanz Briz, Poland’s Henryk Slawik, and from Sweden Raoul Wallenberg and his other Swedish colleagues Per Anger, Lars Berg, Carl Ivan Danielson, and Waldemar Langlet. Not forgetting Count Folke Bernadotte, godfather to King Carl XVI Gustaf, who served as vice-chairman of the Swedish Red Cross which helped release and brought to Sweden thousands of prisoners in the legendary “white buses.’’Folke himself sacrificed his life as the victim of an attack in Jerusalem in 1948 while acting in a humanitarian mediation mission mandated by the UN General Assembly under the Presidency of Oswaldo Aranha, a former Minister of Foreign Affairs of Brazil. Even today, no country in the world, unfortunately, can guarantee absolute respect for human rights or – within its borders – ignore the continued need to provide humanitarian aid or special care to vulnerable people. The inveterate human tendency to disregard those rights and needs – which have been a focus of concern since long before the French Revolution – is the product of human nature or personality when it forgets reason and the human heart, and it has caused terrible consequences and immense pain seeking redress. Underprivileged adults and children and persecuted minorities, especially when subjected to violence and severe physical and mental suffering, depend on protection. Certain humanitarian situations require action, whether in times of conflict or not, such as hunger, serious disease, natural disaster, and social neglect. The effort to remedy such ills has engaged, now and in the past, dedicated people wijo struggled, sometimes in precarious or dangerous circumstances, to guarantee basic rights for the afflicted: the right to life with dignity, to be protected, and to live in security. The task of protecting citizens, a primary role of the nation state, has been undertaken by courageous men and women whose consciences impel them to act vigorously and with generosity, whether in an official capacity or through their own private initiatives. The basic rights of all human beings embrace the realms of the political and civil (such as the right to property or freedom of expression); the economic and social (such as the right to work, to education, and to health) and of the community (the right to self- determination and to peace). But the fundamental right, from which all the others derive, is the right to life, and the origins of its protection are found in the codes and rules of religions and cultures worldwide throughout human history. The first declarations of human rights in the modern era were the Virginia Declaration of Human Rights in 1776 at the outset of the American Revolution, and the Declaration of the Rights of Man and of the Citizen in 1789 at the beginning of the French Revolution. But thereafter until 1948 when the United Nations General Assembly adopted the Universal Declaration of Human Rights, injustices proliferated with little means of a legal response from the international community. Today, International Humanitarian Law refers to a set of rules which seeks to limit the human impact of conflicts, to protect people who do not take part in hostilities, and to restrict the means and methods of warfare. Its modern development began in 1864 with the signing of the First Geneva Convention for the “Amelioration of the Condition of the Wounded in Armies in the Field,” by which the signatory states agreed on practical rules reflecting a delicate balance between their humanitarian concerns and military requirements. There followed the Second Convention in 1906 setting limits on naval warfare, and the Third in 1929 regarding the treatment of prisoners of war. However, a considerable part of international humanitarian law was only consolidated in the Fourth Geneva Convention of 1949 and in its 1977 Additional Protocols, which for the first time mandated the protection of civilians. International Humanitarian Law seeks to establish the clearest possible distinction between combatants and civilians, in order to ensure some rights to the combatants and to maximize the safety of civilians. But what does the law say when civilians are targets of the use of force by their own State, such as when civil wars or ethnic or religious conflicts put a population or part of it under threat from the same State which should guarantee their safety? The answer to this question was not directly answered in those Geneva Conventions, implying a gap in Humanitarian Law which began to be discussed by international society in the 1980s.0ver the past thirty years, the goal of protecting civilians exposed to conflict situations in their States prompted successive approaches: the Duty to Intervene in the 1980s, Humanitarian Intervention in the 1990s, and the Responsibility to Protect in the 2000s. The concept which gives States the “Responsibility to Protect” their populations – against genocide, war crimes, crimes against humanity and ethnic cleansing – was approved unanimously by the UN General Assembly in Resolution A/Res/60/1 endorsed by the Security Council in April 2006. It represented the evolution of international society in terms of Humanitarian Law, as chastened by the tragic examples of Rwanda, Darfur, and the Congo. However, some States even approving the Resolution have difficulties in applying the concept, fearing it will be used as a tool for foreign intervention. The Brazilian position, based on concern for the tragedies of civilians and always stressing the importance of preventive measures, is that the use of force for protection is ultimately justified. In 2011, when traditionally Brazil opened the General Assembly of the United Nations, the President advanced the proposal of “responsibility while protecting” to ensure that the force used to protect civilians not cause more damage than the situation which led to its use. It advocates careful and limited action and opposes unilateral humanitarian interventions or those arising from hidden interests. Great advances were made by the international community in recent decades in order to fulfill the duty to protect civilians in various aspects. Agencies were created by the United Nations dedicated to the care of refugees and of children and to fight hunger. UNICEF, FAO, WFP, UNHCR, PNUD and other agencies now have a significant global presence in providing relief to the afflicted, whether or not they are victims of armed conflict. For the whole of global society, the development of the media was essential to awaken and prepare public opinion, by spreading awareness of the many emergency humanitarian crises caused by shortages, conflicts, and natural disasters, especially in poor and densely populated regions. It became necessary to expand the international community’s ability to cope with those situations and to develop initiatives and projects in a broadly shared way among government sectors and civil society. Prevention, response, and reconstruction became essential. Increasingly, States -whether by their isolated efforts or acting collectively within international organizations- as well as individuals began to develop projects to assist those in need. At the same time, private organizations were created, such as the International Rescue Committee (IRC, at the behest of Albert Einstein), the Cooperative for Assistance and Relief Everywhere (CARE) set up in 1945, Oxfam, Medecins sans Frontieres dating from 1971. And also helping on a broad scale to improve the lives of those in need have been individual citizens, such as Graca Machel, a great lady and friend to whom I pay tribute, the Gates, Buffetts and Safras of this world, Bono, Oprah Winfrey and so many others who have made enormous efforts on their own. In this regard, particular respect and honor should be paid to a great woman of Brazilian descent, the founder of many institutions for the care of children and disabled people, such as Silviahemmet (dementia care), Global Child Forum, Care About the Children, World Childhood Foundation (active in 17 countries), Mentor Foundation (drug prevention in 80 nations), which are having an impact upon the lives of millions of elderly, children and young people, the Queen Silvia of Sweden. The UN General Assembly chose August 19 as World Humanitarian Day to honor those who offer assistance and relief to millions of people, recognizing their sacrifices and contributions in rendering humanitarian services to the disadvantaged. That date was chosen because, on August 19, 2003, many lives were lost, including that of the Coordinator of the UN to Iraq, Sergio Vieira de Mello from Brazil, in an attack on the Mission’s headquarters in Baghdad. The aims of this publication are to immortalize those who have suffered privation – ”to forget is to concede; remembering is an act of defiance” – and to honor men and women who with generosity of spirit dedicated a part of their lives to mitigate the suffering of others. I like to remember as well those who, by migrating to Brazil from Europe in troubled times, saved their lives and through their work contributed to the well being of my country. The conduct of Souza Dantas, Raoul Wallenberg, and all those people who committed themselves, even if momentarily, to the care of the persecuted or needy, manifests not an isolated act but a humanitarian spirit which they embodied and which one hopes will be embraced by all of us.